You’ll want to bookmark this one! Whether you’re in-state or out-of-state looking to apply for PT/PTA licensure in California, chances are you’ve gotten a fat headache just clicking into the Physical Therapy Board of California website. I’ve done the dirty work navigating through link-mania and combing through (most of) the fine print; here’s everything you need to know – submitting your application for licensure, registering for the exams, getting PTLA status (located at the very end), and all the other tidbits in-between – streamlined onto one scrollable page! 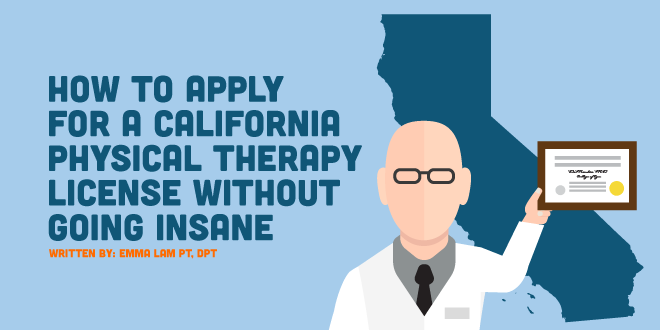 Finally, get your California physical therapy license without the headache! As a disclaimer, this information is current as of February 8, 2017. Also, as much as we strive to be accurate and current here at NGPT, you are ultimately responsible for double-checking everything! Please visit and familiarize yourself with the PTBC and FSBPT websites for the most up-to-date forms and instructions. If there are any questions, we are always happy to help. Just leave a comment below! You need to have passed BOTH the (1) NPTE and the (2) CLE to get your CA License. PTBC: Physical Therapy Board of California – You submit your application for CA licensure and associated payments to them. They are the ones who will be in contact with you regarding your application status. They also communicate with FSBPT; when you meet all application requirements, the PTBC will let FSBPT know you can sit for the exam(s). PTLA: Physical Therapist License Applicant – this is a provisional status that enables you to work as a PT under the “direct and immediate supervision of a licensed PT” for no more than X-number of days pending the results of your first try on the NPTE. The players in this game: YOU, the PTBC, the FSBPT, and then MAYBE your school. I say this because my school offered to help us send in our P1E forms. Don’t worry, this will all make sense later. In any case, your school still needs to help you fill out that form. The timeline you follow will largely be dependent on when you want to sit for your exam, your date of graduation, if you’re applying from out-of-state, etc., but it’s best just to do everything as EARLY as possible. If mailing the application form, the envelope in which it is contained must be postmarked by the application deadline, but again, BE EARLY!